Capital of Summit county, forty miles from Cleveland. This city was first settled by Jews in 1850. 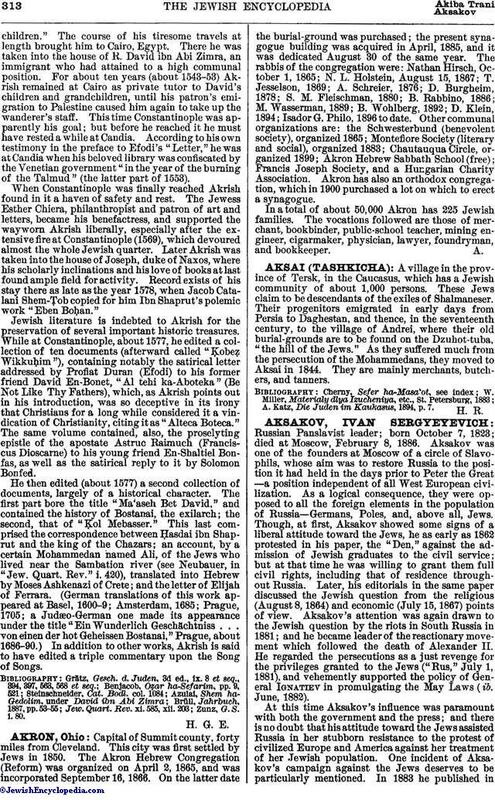 The Akron Hebrew Congregation (Reform) was organized on April 2, 1865, and was incorporated September 16, 1866. On the latter date the burial-ground was purchased; the present synagogue building was acquired in April, 1885, and it was dedicated August 30 of the same year. The rabbis of the congregation were: Nathan Hirsch, October 1, 1865; N. L. Holstein, August 15, 1867; T. Jesselson, 1869; A. Schreier, 1876; D. Burgheim, 1878; S. M. Fleischman, 1880; B. Rabbino, 1886; M. Wasserman, 1889; B. Wohlberg, 1892; D. Klein, 1894; Isador G. Philo, 1896 to date. Other communal organizations are: the Schwesterbund (benevolent society), organized 1865; Montefiore Society (literary and social), organized 1883; Chautauqua Circle, organized 1899; Akron Hebrew Sabbath School (free): Francis Joseph Society, and a Hungarian Charity Association. Akron has also an orthodox congregation, which in 1900 purchased a lot on which to erect a synagogue. In a total of about 50,000 Akron has 225 Jewish families. The vocations followed are those of merchant, bookbinder, public-school teacher, mining engineer, cigarmaker, physician, lawyer, foundryman, and bookkeeper.